This is a template for planning a Roman Catholic Easter Saturday Vigil ceremony in the Ordinary Form. The vigil is the most complicated of the Easter Triduum services, and has a number of options depending on how the Easter fire is managed, how many Old Testament readings are proclaimed, and whether there there are candidates for baptism and / or confirmation. This form can be used to keep track of decisions about specific parts of the service, and to help with communication between the many people who are involved. Only a Microsoft Word version is provided, because you will almost certainly need to add / remove categories based on local needs. The regular Catholic Mass liturgy planning template lists the service elements and has some space for the details of each one. These give space for identifying preparations during the service planning. And they link details of the preparations and people involved directly to the liturgical actions that need them. 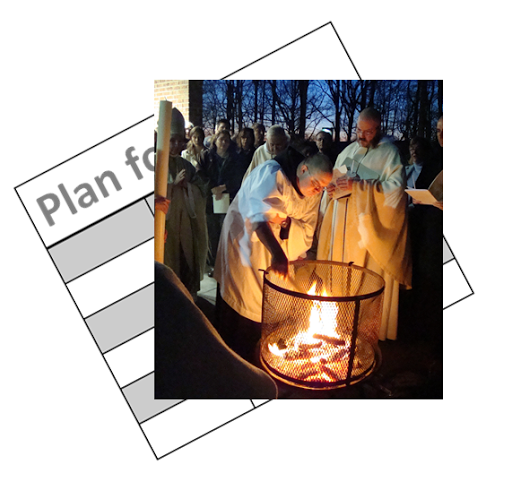 This approach was adopted after using the template to plan several Easter Vigil ceremonies, and several other large one-off services. You may need to add extra items or to delete some. Doing this is simple, because the template is made with a Table. Choose either Insert Columns to the Left, Insert Colums to the Right - or one of the other options as appropriate.